With great advances in the field of implant dentistry, anyone older than 16-17 years can benefit from dental implants. If you have lost or about to lose one, several, or even all your teeth, dental implants should be your first and only option. If you are losing teeth, you should remember, the best time to place an implant may be at the time of tooth removal. Removal of teeth and not placing dental implants will cause the jaw bones to shrink, resulting in bone loss, and more complicated and costly dental implant treatment. Researches have concluded that 80% of all bone loss happens during the first year following tooth loss. For more detail about bone loss read Dr. Khazian’s article “FACIAL BONE LOSS AND PREMATURE AGING“. Facial bones in people younger than 17 undergo dynamic growth changes and may not provide a stable base for implant placement. However, these conditions should be carefully evaluated by an experienced dental implant expert for proper treatment. For more detail about this, read Dr. Khazian’s article “DENTAL IMPLANTS IN ADOLESCENTS“. In today’s modern dentistry, dental implants offer the most intelligent solutions for teeth replacement. Replacing teeth with dentures or bridges is no longer the best option or even an acceptable one, and dental problems associated with these restorations are complex and varied.To find out how best you may benefit from dental implants, your condition should be carefully evaluated by an experienced dental implant expert. This evaluation includes, but is not limited to: number and location of missing teeth, the jaw bone condition, your overall health condition, facial esthetic considerations, the health of your gum, the condition of remaining teeth, the condition of your jaw joints (TMJ), the position of nerves and blood vessels in relation to implants. It is important to know that dental implant treatments are usually complex and require careful attention to many different factors. Every patient has its own unique condition, and therefore need their own unique treatment plan. By being an educated, informed patient, you may eliminate the fear of the unknown and benefit more from your treatment outcome. Read and learn about dental implants. Our website is the most comprehensive source of information in the field of implant dentistry. 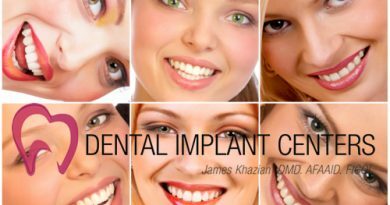 To provide you with the latest about dental implants, it is being constantly updated by Dr. Khazian. From the replacement of a single missing tooth to extensive reconstruction and replacement of several or even all teeth, Dental Implant Centers offer the healthiest and most intelligent treatment solutions. We provide the most comprehensive treatments for dental implants in San Diego. Both surgical and restorative phases of your dental implant treatment are performed by Dr. Khazian. There will be no referral back and forth to another doctor or office. This means a more consistent, smoother, and faster dental implant treatment.